As the weather warms and the snow melts more and more each day, it’s hard not to get into the spring spirit this time of year. With an early Easter to celebrate and Tax Day coming up, we’re compelled to start cleaning, organizing, and generally preparing for a fresh start. This same feeling should also apply to a spring cleaning of the computer! After sifting through a pile of sticky notes on my desk and flipping through a folder of inspiring images on my desktop, I’ve chosen to share the following six favorites collected during this winter’s hibernation. Interestingly, there seems to be a running thread of metallic and over-the-top items in this round-up, leading me to assume that with the daily inundation of imagery we’re exposed to, it takes quite a statement to make a lasting impression. #1. 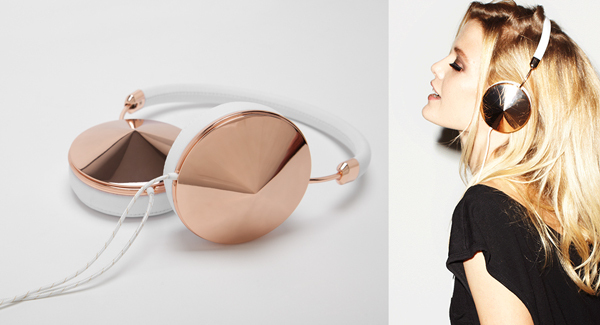 First up is the collection of luxe headphones by Frends. I learned about them from a Refinery 29 email back in January proclaiming they were “The coolest headphones we’ve ever seen. Ever.” Indeed, I’ve never seen headphones look so good (like a premium handbag-turned-piece of jewelry for your head), but this was not the first time I’d heard of Frends. The brand was started in 2006 by a couple of pro snowboarders and over the years has grown into a whole crew of frends (there’s no I in friends). I remember their booth at Agenda (an action sports tradeshow) in Huntington Beach a few years ago, because I had stopped to chat with one of the frends, Scotty Lago, a rider from New Hampshire who I’d met a few times before at various industry events. Back then, the booth was filled with t-shirts (no headphones yet) and it’s nice to see how far they’ve come, from channeling their individual expressions of style in snowboarding to a covetable expression of style in fashion. #2. I love these images of French artist Hubert Duprat’s fascinating work, although it might be more accurate to commend the work of the Caddis fly larvae, who are the true artists behind these gilded creations. The Caddis larvae live in fresh water and construct protective cases of found materials from their environment (usually things like pieces of wood, shells, sand, stones, etc.). Since the early 80s, Duprat has been collaborating with these specialized creatures by moving them to a home aquarium and replacing their natural building supplies with gold leaf, pearls, and semi precious stones. As Duprat describes, he “creates the conditions necessary for the Caddis to display their talents.” The resulting sculptures are so organic and unique, can you imagine wearing one as a piece of jewerly? #3. 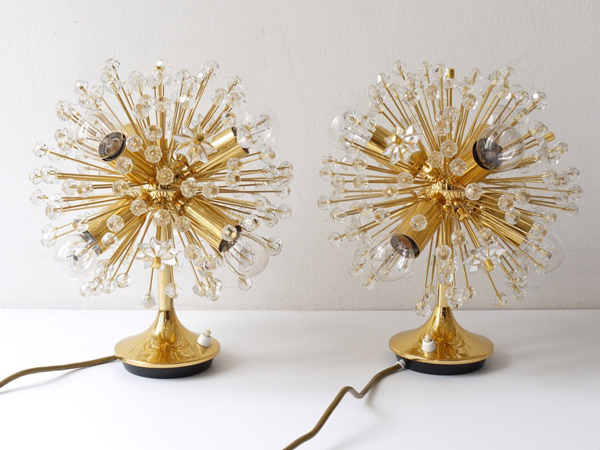 Keeping with this theme of intricate metallic “objets d’art,” I’ve been kind of obsessed with Emil Stejnar’s pusteblume light fixtures ever since I wrote about them in a Misc. Six post from last year. Since then, my husband and I have procured two matching wall sconces and a large chandelier to hang in our bedroom. In fact, we’ve purchased additional fixtures that have been either stripped for spare parts or resold upon finding better options. While most of the current availability on the market are of similar ceiling pendants differentiated by size and condition, every once in a while a really unique piece from the collection pops up that surprises me. For example, I’ve never seen anything like this set of table lamps we found on eBay a couple weeks ago. They wouldn’t have gone well in our house and ended up selling for an unknown “best offer,” but it’s still fun to save the lovely imagery as part of my own digital collection of inspiring home décor. #4. 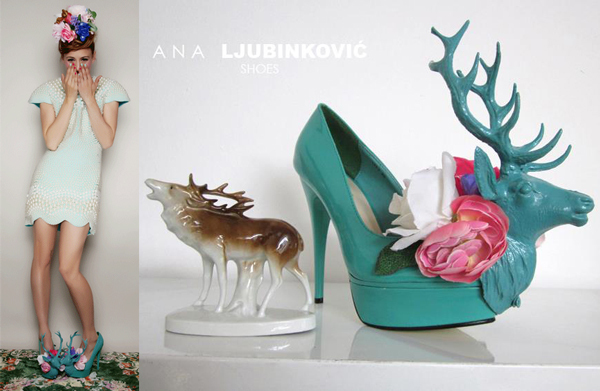 A friend sent me the link to Ana Ljubinkovic’s Showcase 2013 collection, knowing that I would be enamored by her imaginatively whimsical aesthetic. After pouring over her Spring and Fall lines from 2012, I was an instant fan – from her eclectic mix of colors, textures and shapes, her looks are all very girly-glam, while some elements seem edgy and even retro-inspired. Of course I love her intricate work with pearl encrusted surfaces, but was especially taken with her deer head shoes, which spoke directly to my personal affinity for anything with a kitschy Swiss ski-chalet vibe. In fact, these over-the-top shoes have already inspired a pair I have in the works for my upcoming baby shower, so stay tuned to see my own take on fantastical footwear! #5. Here’s an unexpected collaboration that was fun to stumble upon. 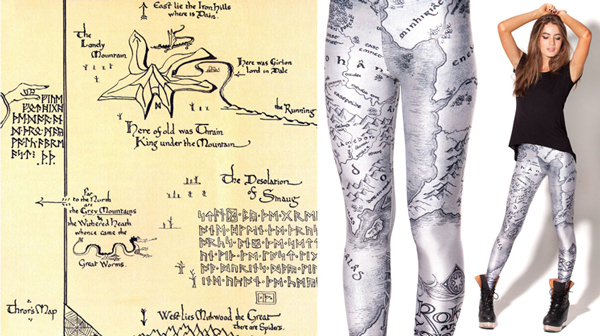 BlackMilk clothing, the Australian maker of all things printed spandex (mostly leggings), has teamed up with the powers of Middle Earth to offer a line of Hobbit and Lord of the Rings pieces so fan girls can “get your nerd on,” as designer James Lillis explains. I remember reading the Hobbit and subsequent trilogy some time around 5th grade after my dad had passed the set of books from his own childhood on to me. My favorite thing about the whole experience of exploring Middle Earth were the maps to be found on the endpapers of the books that were so artistically and authentically illustrated to compliment the stories. So while I’m afraid I would not be interested in wearing a dress featuring the likeness of one of the movie characters, when I saw the Hills of Gondor leggings, my inner nerd definitely paused to consider adding-to-cart. #6. Just a couple of interesting coincidences on the catwalk. 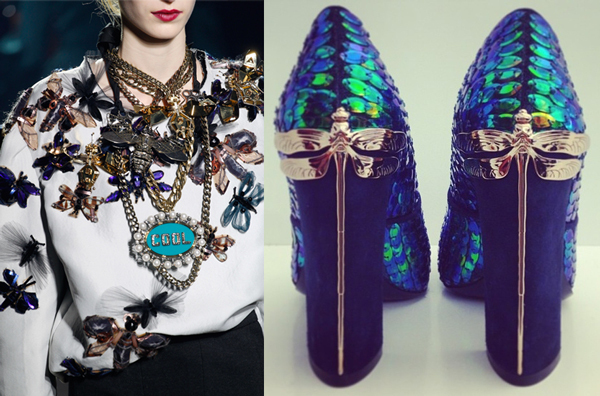 First is a love for creepy-crawlies; both Lanvin (above-left) and Tory Burch (above-right) centered much of their Fall 13 collections around various beetles and bugs. If you think about it, this motif makes a lot of sense what with iridescent finishes and lucite accents coming on strong in the last year, as well as Fall being the perfect time to find inspiration in darker, more gothic details. No sooner had I taken stock of Tory Burch’s clever execution of placing a custom piece of hardware (the dragonfly) up the back of the heel, but I stumbled upon some Spring 13 shoes from Viktor & Rolf (below-left) and Diane von Furstenberg (below-right), who’s chrome-ball hardware up the heel makes it look like the two brands were sitting at the same table during a design brainstorm session! Nevertheless, this trend in new hardware shapes is a statement I can’t get enough of. This entry was posted in misc. six. Bookmark the permalink.